It was April of 1803, General Toussaint L’Ouverture laid chained in a castle prison in France and would soon be dead in a matter of days. For over a year he’d been imprisoned there after being captured in Haiti leaving the revolutionary army he’d helped build under the control of a man by the name of Jean-Jacques Dessalines. While Toussaint lay shivering and dying in France, Napoleon Bonaparte was also making a major decision the same month. It was on April 10, 1803, that he told his finance minister that he intended to sell the whole of the Louisiana territory to the United States. A day later on April 11, the proposal was made and France sold 828,000 square miles of American land to the U.S. for the equivalent of $233 million in 2011 dollars. It should be noted that Thomas Jefferson was vocally supportive of France retaking Saint-Dominique…as one might expect. Though I ‘m sure he was stunned when the proposal was made since the Louisiana Purchase doubled America’s size at less than $0.03/share! Napoleon still had one more problem and that was Jean-Jacques Dessalines. He’s the man who is regarded as the founding father of Haiti and prior to becoming a revolutionary leader, he’d serve as an Officer in the French army. 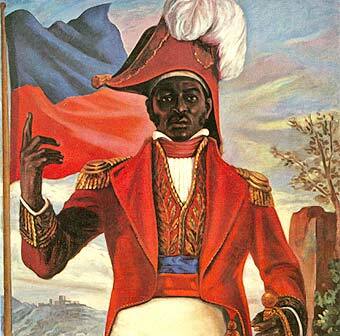 It would be in 1804 when Dessalines would declare Haiti an independent nation and would proclaim himself Emperor. Before that could happen though, a very critical battle had to be fought. A decisive battle that would see the mighty Haitians defeat the forces of France under the rule of Napoleon Bonaparte. Napoleon himself would not be on the battlefield leading his men, in the way that Dessalines and Toussaint had. No, leading the French forces would be two brutal men named Charles Leclerc and then Donatien de Rochambeau. What was about to happen would have a dramatic impact on world history, allowing America to become the country that it is today. Most people don’t realize that before the signing of the Louisiana Purchase in April of 1803, Napoleon Bonaparte had several agendas in fact that he attempted to play out between 1801-1802 (both failed miserably). One agenda involved the sending of 50,000 French soldiers, under the command of Charles Leclerc, to the island of Saint-Dominique to crush Toussaint and re-institute slavery. This occurred in February of 1802 before Toussaint was captured. The largest invasion fleet in history at the time crossed the Atlantic to retake the island of Saint Dominique (Haiti) from the formerly-enslaved black revolutionaries led by L’ovouture, Dessalines, and other black generals. The other agenda, however, involved a treaty Napoleon had signed with the Spanish in 1800. This treaty ceded the land Spain claimed (with no consent of indigenous Americans by the way) in America to the French. So this second agenda of Napoleon’s included sending a second army 20,000 strong into America to plant the French flag firmly in the Louisiana territories. This would have posed a major military threat to the new American state so young that Thomas Jefferson was still in office. The French army at the time dwarfed America’s and as John Baptiste writes in ‘The Half Has Never Been Told: Slavery and the Making of American Capitalism,’ Jefferson was not too keen on fighting the French army…alluding to the possibility that America may have to try to get back in Great Britain’s good graces if it came to war with France. In Haiti, Leclerc was able to win several battles against the Haitians and tricked Toussaint into negotiations in May of 1802 (some say with the help of Dessalines who may have wanted to take Toussaint’s place). Once Toussaint arrived, he was captured and taken to prison in France as mentioned above. However once Dessalines and the other black revolutionary leaders found out that Leclerc meant to re-institute slavery…the warring continued. This renewed round of fighting was now led by a much more brutal Dessalines at a time when the French army was hit with a yellow fever outbreak. Charles Leclerc himself died of yellow fever in late 1802. Dessalines wrecked havoc on the French military all throughout late 1802-early 1803. So much so, that Napoleon began losing interest in the Western hemisphere altogether and felt like he had even bigger problems facing him with his European rivals Great Britain and Prussia. Napolean was forced to change the course of the 20,000 soldiers he sent originally into North America to claim the Louisiana territory. Their new mission was to do what the previous 50,000+ (with tens of thousands of reinforcements) couldn’t. They were met at Port Au Prince and Les Cayes and they too were defeated, with the remaining forces retreating. The day was November 18, 1803. Toussaint L’Ouverture was dead and the fate of the Haitian people lied within the genius mind of Jean-Jacques Dessalines. Dessalines wasn’t going to partake in the taking of Vertieres himself, however. He gave that order to Francois Capois, a high-ranking military officer who had been involved in the revolution since 1793. Capois was about to fight the battle to end all battles in what would become the finale of the Haitian Revolution. Napoleon’s French army had all but scrambled out of the region with a tiny group left with Rochambeau as their leader. Vertieres was a French fort just south of the town of Cap Haitien (formerly known as Cap Francais). Starved of resources and supplies, due to a British blockade being in place as a result of growing tensions between Great Britain and France, 5,000 French soldiers stood between victory and defeat for the rebel, revolutionary Haitians. Rochambeau watched from the ramparts as his men held back wave after wave of Haitians led by Francois Capois. Eventually, they were able to break through and face the French soldiers head-on. It wouldn’t be long until the French units began panicking and falling back. Rochambeau himself made sure he escaped as he didn’t even wait to see if his men would succeed or not…he knew it was over. The following day Rochambeau sent a French officer to meet with Dessalines and come to terms for surrender. Dessalines gave them 10 days to embark on a ship and leave the island…and they did. However, they left behind wounded and captured French soldiers who would suffer a terrible fate in the coming days. An often ugly side of revolutions is the brutality that comes along with them and the Haitian revolution is no different. Jean Jacque Dessalines had a vision for Haiti that was all-black and did not involve the white French men and women who had formerly enslaved them. So between February and April of 1804, mere months after victory at Vertieres, Dessalines ordered the killing of all white French men and women. Soldiers moved from house to house murdering entire families and there are engravings that show this. The numbers of how many were killed vary, however, I have seen numbers up to 6,000. That is likely a conservative number though. Dessalines went from town to town making sure his orders were carried out completely. Often times when he had arrived, he saw that in many cases the mass killings were not carried out. So he’d read out the crimes committed by their former White overlords like Rochambeau and implicate all the Whites in the town…then he’d watch as his men massacred every White person in that particular town. The massacres of 1804 had a major impact on America as word got out on what was going on in Haiti. It became a source of great fear on American plantations as enslavers began thinking the same might happen there. The Haitian Revolution in its entirety had a positive impact on populations of the enslaved around the Caribbean. It inspired slave revolts in Jamaica and in America as well. All revolutions occur when a population begins to feel as if they have been backed into a corner and that the only way to free themselves of this reality is to overturn the current ruling class. That was certainly the story of many Haitians who lived under the brutal tyranny of the French slave system.